I’m ending my 31 days early. It’s my exhale. I’ve loved writing this series. It has been cathartic and built discipline. But these last few posts I had planned are not clicking. I’m wound tight trying to pull the ideas out and put them here for you. Then I remembered why I’m here. First, I am here to write. Good. Bad. Inspired. Planned. Choppy. Whatever it is, just write. Second, I’m here to be real. My one rule in writing here is that it represent my truth. It may not be your truth, but true to me and who I am and what I feel. Even if it’s wrong. 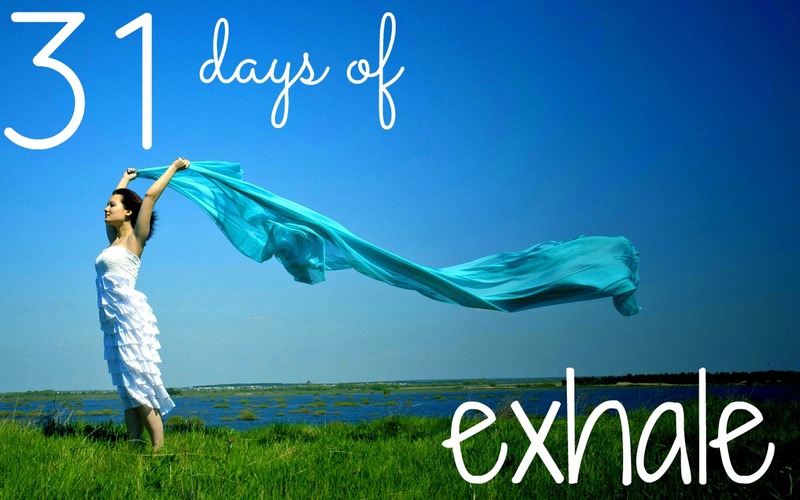 Third, this whole month has been around this notion of exhale. This idea that I’ve spent too long holding my breath and clenching my teeth. Too long trying to control air. This is where I got stuck yesterday. I’ve done this for 28 full days. I’ve practiced letting go of my breath and my chains. I’ve worked to put down that which I was never meant to carry, face my fears, own up to my anger, adjust my reflection, renew my faith, and find inspiration. Ending here is the ultimate test in exhale for me. I hate to leave things unfinished. I had my list and my plan for days 29, 30 and 31. This was not it. But I felt my shoulders creeping up and my fingers typing tense, so I’m making a choice. I have no pretty bow to tie this package in. All I have is my breath and my dance. If you’ve missed any of the series, please click on the link below.